In protest, a month before my first grandbabe was born, I participated in a 10k run and my guy and I flew off to Italy to share a villa with friends. No old biddy waiting for grandchildren was I! And then my daughter went into labor, calling me at 11:04 p.m. to let me know she was on the way to the hospital. Her husband texted me every hour at first with updates. My guy groaned when the phone beeped at my pillow at 1 a.m. and 2 a.m. and so forth. By 8 a.m. no progress, and as the sun grew high in the sky, I became a crazed aged terrified old woman. I walked the woods around our house like a crone startling the wild kingdom, tearing my graying hair out by the roots. I called my good friend the minister, who hadn’t ministered to me in years and now lived thousands of miles away, begging him to pray for my daughter and as yet unborn grandchild. He soothed me as my feet crunched on wooded moss and dead leaves and assured me that all would be well. So despite my daughter’s wishes, I made my man drive us to the hospital so we could pace in the waiting room. The receptionist assured me (five times) that my daughter was in the labor room. My son-in-law had last texted an hour ago that she’d been pushing for four hours. I wanted to MURDER the doctor who let her (and my grandbaby) go through this ordeal. My guy gathered me in my arms every so often and whispered ‘reeeelaxxxxx,’ but I couldn’t. Was this what being a grandmother meant? Good lord, if I’d known, I would have handed better birth control to my children as soon as they hit reproductive age. No other message was on my cell phone. I stalked the receptionist, who suddenly was terribly busy and ignored me. My guy told me to SIT DOWN. I started crying too, of course, instantly forgiving him for sending out a group text a second after the birth, but not realizing that my cell number wasn’t included. Because at that moment, as I became a grandmother, everything was perfect. Grandparent’s life doesn’t end at the birth, they get a whole new lease of life chasing grandkids and teaching them to say Nanna or Pops before Mummy and Daddy, and letting them get away with things you’d never have let your own children get away with. Revenge is so sweet. You, dear sir, have obviously have had much practice with this revenge. Fun, isn’t it?! John Milton would have been proud of you proving once again, “…they also serve who stand and wait.” Congratulations! 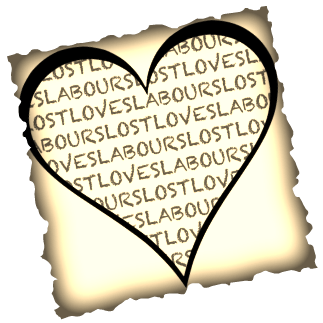 Love’s labor definitely won! I’m puffing with pride that I proved an idiom by John Milton. Serve by standing and waiting for sure – he should have added the 6-letter word: serve, stand and STRESS! Lovely post Pam – love the image of the wild-eyed old woman in the woods scaring the rabbits! That’s me, for sure, wild-eyed in the woods. Funny how the woods is like a primal place to let off steam and stress, isn’t it? It is so much worse watching/waiting for a child to go thru ordeals than it is to go thru it yourself! And, unfortunately, like her Momma my daughter had 2 emergency c-sections. But, oh, the indescribable joy of being a grandparent! You know you are going to love your grandchildren, because you know how much you love your kids, but then you get handed this bundle of love that is your child’s child and the whole world changes…. The whole world changes, indeed! I enjoyed this story. Made me smile with warm memories of my grands. 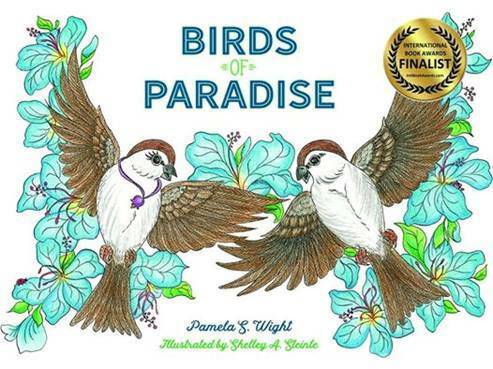 Thanks for taking the time to read my story – and reminisce about yours! How timely! Our daughter is halfway through her first and probably last pregnancy. After years of trying, they are having a little girl in the fall, 3500 miles away from here, but we will be there! YESSS! HOW EXCITING!! 3500 miles will never keep you away, I know. What a lovely story 🙂 A really great post! A true compliment from a true writer. THANKS. All the best to you and yours. Enjoy it all. Picked up my 18 year old granddaughter at SFO yesterday from finishing her first year away at college. A treat! Transporting her home for the summer to Redding. She is interning for a political campaign. My own grandma died when I was five. Not running any 10K, but happy to share in these young aspiring lives. You are an inspiration – I so want to be as close to my grandchildren as you are to yours, and still be a big part of their lives when they’re off to college. Yay to YOU. I remember that moment…nearly 9 years ago (grandma at about 47 y.o. )…and I still remember the way my boy held his own son and just stared at him like it was too much to believe. I vaguely remember my maternal grandma passing away when I was about 10. I’d only seen her once in my life. I knew no other grandparents, so have very little experience with what it is like to have grandparents. The photo at the end is a really cute one. That little baby looks so peaceful and so….possessive! I like the way you were able to pour your anxiety, relief and love into this post. I remember my grandparents, but they weren’t as much a part of my life as I hope to be to my grandchildren. Between walking half marathons and writing masterpieces, I’d like to play and read and listen to music (with eyes closed) with the grandkids. Thanks for feeling the anxiety/relief/love in this post – that’s what I hoped to do. Sorry – I hit “Post Comment” before realising I hadn’t said “Congratulations”. 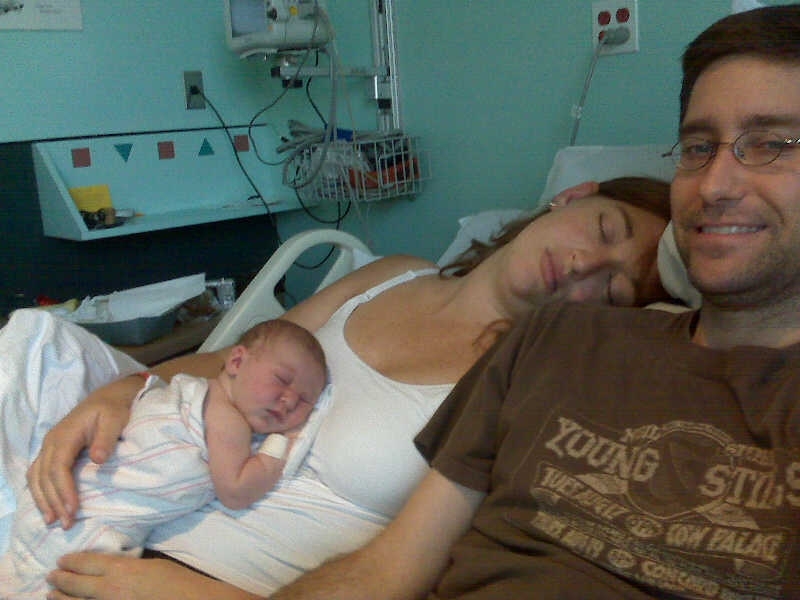 The last photo says it all; Mom and baby zonked, Dad smirking. LOL. Congratulations, Grandma! I know, it’s rather iconic, isn’t it? :-0 I think that’s why I love this photo so much- it’s very REAL. Aha! Yes, the road ahead will be very interesting for you. I thought it would be a number of years after the wedding before the round of ‘grandkiddies’ came, but I was wrong. Three of them came, just like that, in the past 4 years! Great photo of Nadine and granddaughter; totally spent; son-in-law not so much! Loved the post. Walked me through not only childbirth, but relevant to other expectation moments in Life. I could feel the relief in your embrace with “the monster” (as Courtney calls him); relax, relax. Not so easy to do, but a relief none the less. At the birth of our grandson (expecting more by this time, but alas), we were told to stay away from the hospital. Did the parking lot count? We thought not. I was taking care of my baby; 2 month old Chocolate Lab in the back of our pickup, waiting for the call from the hospital parking lot. It came and the emotions flowed sweet. Daughter and child healthy; son-in-law a mess. Just as it should be. Ha ha. I can SEE you, pacing that parking lot. Oh dear, the roads we have traveled to ‘not be there,’ yet to BE THERE, every step of the way. Aw. He wanted to tell you in person! Good for him. This was such a lovely post — and you have such a beautiful family! Here’s hoping you had an extra Happy Mothers’ (and Grandmothers’) Day! Mother’s Day seems a bit contrived, and yet… I still bask in the phone calls and the flowers and the ‘love you’s,’ I admit. As much as it may be a ‘made-up’ holiday, any day to celebrate family is a good one, huh? Very cute story, Pam. I felt your shock when you learned you weren’t on the receiving end of that group email announcing the momentous event!! Happy Mother’s Day to all the Mothers & Grammas who really didn’t know, in advance of each birth, how much that tiny, wonderful creature would change their lives—for the better. I have 4 amazing grandchildren and have so much fun with them. They keep you young and up-to-date. Thanks for your wonderful post. I loved the title and how you reversed the Love’s fortunes. I found this link and was blessed with a different side of you! I was embracing this grandmother to be who was a “nervous Nellie!” It wasn’t my friend Pam, no way! 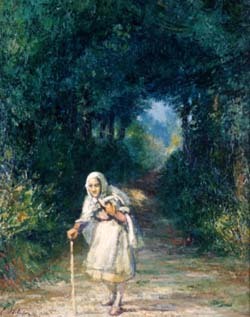 I enjoyed the old woman walking along a dirt path with her age showing. What a precious picture of the new baby, new Mommy and Daddy, too.